Why a Florida Beach Wedding? There’s just something so romantic about a couple saying their wedding vows to the tune of the ocean waves crashing behind them. 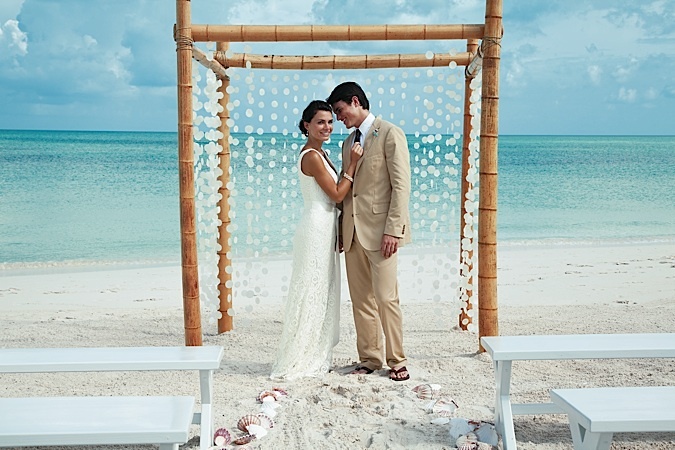 Ideal I Do’s has the perfect pretty beachside ceremony – yours to customize from $299 to $1999. A great beach wedding at a very affordable price. If you’re considering getting hitched near the South Florida ocean – whether it be Miami, Ft. Lauderdale or anywhere in Palm Bach, we’ve got some wonderful beaches for you to choose from. We know all the quiet beaches too! These beach weddings are so idyllic, they’ll make you want to hit the coast, post-haste. Choose a tropical Florida celebration, seaside nuptials are beyond breathtaking. We provide the arch, aisle, chairs, music, photography and video – we even bring champagne and refreshments to the beach! Contact Ideal I Do’s and start making your beach wedding come true! This entry was posted in Florida Beach Weddings, Local Florida Flavor, Locations, Money, Time and Work Savers, Real Weddings, Uncategorized on April 15, 2016 by admin. Beach Destination Wedding – The Best Choice for Families! The beautiful bride and her handsome groom saying their vows before a minister, standing on a platform decorated with fresh flowers under a billowing white arch, or canopy, fashioned in part from a hand-embroidered family heirloom amid the soaring ocean waves surrounded by family and friends, some standing, some on white chairs around them. Most had traveled hundreds of miles to join the weekend-long celebration of their beach wedding. I had a first-row seat, holding my husband’s and children’s hands and wiping away tears of joy. Like twenty five percent of American couples getting married this year, according to research , my daughter, and her new husband opted for a destination wedding in Ft. Lauderdale, Florida, at the beach, at sunset. These days, all of the family are often part of the destination wedding equation. In our case, there were a lot of children present, including a baby who had come from the Bahamas and one preschooler very excited to show off her own “bridal gown”. 10 years ago we had a destination wedding in New York City where we lived. Such weddings were far more uncommon and truth be told, I don’t think my mom was particularly pleased. We thought it would be easier with our busy work schedules and with family spread from Vancouver and Dallas. Today, when you think destination weddings, you might think, as I had, a beach in the Caribbean with just a few people making the trip. But Florida is becoming as popular these days. As the ease of coming in and out of our airports and not having to deal with passports and governments of foreign countries is also in our bride’s and groom’s minds. But in fact, destination weddings average 75 guests and more destination weddings take place in the United States than abroad, according to the research from The Knot.com, often with celebrations spread out over a few days, which gives far-flung family a chance to reconnect. Almost half the destination weddings in the U.S. occur in three states: Florida, California and Nevada. One New England couple I know, for example, chose Miami so that the groom’s elderly and disabled grandparents, Florida residents, could attend. Sometimes, the destination is purposely chosen because it will be kid-friendly. The beach is one of those family friendly wedding destinations. Packages combine the wedding, multigenerational celebration and honeymoon. In our case, the celebration started in Ft. Lauderdale where the bride and groom chose to take a cruise from, the Wednesday before the wedding and didn’t really end until two days after the wedding. Couples often choose a place that has special meaning for them. Places that couples have enjoyed vacationing in the past or the site of the proposal are especially popular. The bride and groom also wanted their guests to enjoy the surrounding area including diving and fishing and tours of Miami, the Florida Keys and the Everglades, which they had come to love. The couple detailed some of their favorite activities in the welcome bags they left for guests and were gratified that most took note of their suggestions. Of course, it was tough for the mother of the bride to be 1,000 miles away during the planning — this was not an all-inclusive resort where an in-house planner sweats all the details. I hired everyone from the officiant, to the photographer to the caterer for the Sunday brunch based on a phone calls and emails. All worked out well. But like at any wedding, things didn’t go exactly as planned, like the unseasonably cool weather. Everyone just grabbed an extra jacket or sweater over their wedding finery. After the afternoon rain, we quickly wipes the chairs dry before the guests arrived. The key — just like on any trip — is not to sweat the small stuff, keep smiling, and enjoy the moment for all it’s worth. So there we and the groom’s parents sat on the beach, the afternoon after the wedding, looking out at the crashing waves at Hillsboro inlet with our kids and the friends who had traveled so far. Keep in mind that South Florida Beach Weddings are great for all ages! This entry was posted in Florida Beach Weddings, Local Florida Flavor, Locations, Money, Time and Work Savers, Real Weddings, Recommended Vendors and tagged +wedding +packages on the +beach, affordable +fort +lauderdale +Beach +wedding, affordable beach weddings florida, affordable beach weddings in florida, affordable destination wedding packages, Beach Destination Wedding - The Best Choice for Families!, destination florida weddings on July 2, 2015 by admin. When most people hear the word “elope” they may think of the young couple sneaking out of their upstairs bedroom windows with knotted sheets in the middle of the night to get married quickly and without the approval of their parents. Today, that is far from the case. A new king of destination wedding has emerged. Enter the Destination Elopement. Maybe as a growing trend due to harsh realities or work calendars or the realization that the wedding should be about nothing but the two people involved. But many couples, both first time and second wedding couples, are looking for alternatives to the large, traditional wedding without giving up the unique touches that make the memories that last for a lifetime. Beach wedding planners like Ideal I Do’s are seeing more and more couples choosing a smaller, elopement type wedding often at a destination they like to visit such as the beach. Some beaches and destinations hold special memories for them. For this reason, Ideal I Do’s is offering “elopement packages” to provide the services they seek. Couples find that they can have a beautiful, classic wedding with all the trimmings at an affordable price by choosing a package that has already been planned out and ready to go. 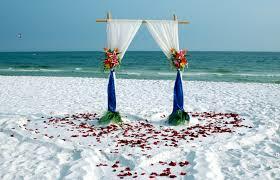 Arch, aisle music, video, photography and of course officiation are all available for our beach weddings. An elopement wedding may be for the bride & groom only, but sometimes a very few close family members or friends attend. More recently, the distinction between an elopement and a destination wedding has become blurred. A destination wedding is a wedding that is held in a location people like to travel to for vacations – such as resorts, bed & breakfast inns or beaches. It is usually some distance away from the bride and groom’s residence. For this reason, the destination wedding tends to have a smaller guest list than a traditional wedding held in the bride or groom’s hometown. Since fewer people attend the destination wedding, couples often will have a large reception at a later date (and present a slide show of their wedding pictures at the reception. What fun! So, why are destination weddings and elopements on the rise? Economic issues aside, it’s just a fact of modern day life that, compared to a generation ago, today’s young men and women are likely to locate farther from the area they grew up in. This means they are more likely to meet a mate from a greater distance away. The ease of getting to the destination has also lifted, both in money and time. With a destination wedding or elopement, the couple may stay a little longer and combine their wedding and honeymoon. In Florida, many couples take a honeymoon cruise after their wedding. In some cases, their closest friends and/or family members attending the wedding will also stay longer or join them. If they stay on the mainland, they may schedule in some recreational activities such as golf, tennis, boat tours, night clubs, everglades, deep sea fishing or sight-seeing. One may think the destination wedding would be expensive and difficult to plan. But actually, destination weddings can be much less expensive than a large traditional wedding and easier to plan too. By having all the elements of the wedding already planned out with an elopement package, the couple knows the total price up front and can budget accordingly. The destination wedding or elopement package that includes lodging, wedding cake, photography and flowers saves the couple both time and money. The planning is made easy and stress free. This gives the couple the opportunity to spend their time enjoying each other’s company instead of stressing over every detail of the big wedding. This entry was posted in Florida Beach Weddings, Local Florida Flavor, Locations, Money, Time and Work Savers, Real Weddings, Recommended Vendors on June 23, 2015 by admin. Your Destination Wedding Questions Answered! Your Destination Wedding Question Answered! Why have one? If you’re looking for a unique way to say “we do” while surrounded only by your closest friends and family members, a destination wedding in a romantic location is ideal. Where should we have it? Having a destination wedding allows you to exchange vows in a stunning paradise. Whether you envision your ceremony on a white-sand beach, atop a cliff overlooking the ocean, within a blooming garden, or surrounded by mountains, the options for Florida Destination Wedding locations are as limitless as your imagination. Do I have to spend a lot? Destination weddings can be as lavish or simple as you desire and there are endless options to fit all budgets, from a luxurious reception in a ballroom to a casual beach party. How many guests should I have? Destination weddings allow couples to have intimate celebrations with just a few guests or a larger wedding with as many as 100 friends and family members. A destination wedding allows you to spend quality time with your guests in a relaxing setting over three or four days, making memories for years to come. Aren’t Destination weddings more expensive? Destination weddings are typically less expensive for couples than traditional celebrations, as guests usually pay for their own travel and accommodations. You can also mix and match our packages and options – they start at only $149! A destination wedding is most successful when planned by an expert who can assist with the considerable planning and research that it takes. What does Ideal I Do’s do exactly? We work on creating personalized celebrations with outstanding service is what. For more information about idealidos.com, call us anytime at 800-6-Idealidos (643-3254) to speak with one of our customer service representatives. We look forward to making all of your destination wedding dreams come true. This entry was posted in Florida Beach Weddings, Local Florida Flavor, Locations, Money, Time and Work Savers, Real Weddings, Recommended Vendors, Uncategorized and tagged Your Destination Wedding Questions Answered! on June 18, 2015 by admin. Have the perfect cheap destination wedding in South Florida! The U.S. State of Florida offers the exotic feel of the tropics — beaches, tall palm trees, wonderful weather, fishing and diving — with no hassle whatsoever. 1. Pleasant breezy mornings – There’s a quiet luxury to mornings on your terrace when early risers can brew coffee and curl up on a patio while the rest of the party sleeps in. Watch the sun rise while you sip your joe and eat your croissants. Snap a few selfies! Whether you have eloped to the beach and the two of you honeymooning or the whole family traveled with you for the big event, you can find hotel rooms, houses, even villa-style accommodations with the ease of leisurely mornings and meals at any hour, plus all the amenities you expect from Florida destination level regard for your comfort. 2. The Florida Everglades are the largest continental U.S. National Park, and a green swath of sawgrass swamp serving as an inspiring big-day backdrop or additional photo location if you so choose. Although brides are prohibited from arriving at their beach ceremonies via parachute, Florida is a playground for adventurous couples looking to hike, fish, explore the everglades via kayak or Jeep or seek out hidden snorkel spots. 3. Beaches for every personality from off-the-beaten path to packed party spots with blenders whirring, Miami, Ft. Lauderdale and Palm Beach counties offer a beaches suited to every traveler. Biscayne Bay is Miami Beach’s most famous and most popular bay, making it especially good for larger groups. But when it’s just the two of you, steal away to spots like the Key Biscayne Lighthouse or the Hillsboro Lighthouse. 4. Everybody for Scuba or snorkeling along Deerfield beach. All divers and snorkelers are welcome – Couples who take to the sport can continue courses with private lessons or group instruction. Plus, the dive boat — and the beach — are just yards from your room. 5. In the Details RJ, owner of Ideal I Do’s, isn’t in the business of planning just destination weddings — she handles every detail of destination vacations. A wedding designer with years of beach destination wedding experience, she arranges the big-day necessities and caters to every whim (she’s even pulled of surprise weddings). RJ also handles the accommodations, day-after brunches, wedding-party excursions and so much more. This entry was posted in Florida Beach Weddings, Local Florida Flavor, Locations, Money, Time and Work Savers, Real Weddings, Recommended Vendors, Uncategorized on May 11, 2015 by admin. Is a beach destination wedding right for you? If your dream destination wedding involves breathtaking scenery at a beautiful beach, all within an affordable budget, and reasonable time constraints as well, South Florida is the place you’re looking for. Not only do our hotels and resorts offer incredible experiences but also incredible prices all just hours away. • If you’re looking for a unique way to say “I do” while surrounded by your closest friends and family members, a destination wedding in a South Florida is an affordable romantic location for you. • Having a destination wedding allows you to exchange vows in a stunning paradise. With only the most important people with you. Envision your ceremony on a white-sand beach, or a balcony overlooking the ocean, within one of our beautiful natural parks, or at a beach house the options for destination wedding locations are as limitless as your imagination. • Affordable Destination weddings can be fancy or simple and there are endless options and beaches to fit all budgets, from a beautiful elegant restaurant, to a room overlooking the sea, a roof top pool setting, to a casual beach party you will find it here. • Destination weddings allow couples to have intimate celebrations with just a few important family members and friends. We keep it simple and elegant. A destination wedding allows you to spend quality time with your loved ones in a relaxing setting over three or four days, making memories for years to come. We can even arrange your transportation and entertainment. • Affordable? YES! Destination weddings are typically less expensive for couples than traditional celebrations, as guests usually pay for their own travel and accommodations. • A destination wedding is most successful when planned by an expert who can assist with the considerable planning and research that it takes. • Our award-winning, Certified Destination Wedding Specialists have planned over 20,000 successful destination weddings in 42 countries. DestinationWeddings.com has been internationally recognized as the industry leader in planning personalized destination weddings. • Ideal I Do’s looks forward to making all of your destination wedding dreams a reality. What makes a good destination wedding couple? A beach destination wedding is an opportunity for couples to celebrate their marriage at a gorgeous beach of their choosing away from home. Ideal I do’s couples are from all over the world, Europe, Carribean, South America, Asia. Florida destination weddings can be intimate (just the two of you), limited to close family and friends, or a big family and friends affair with hundreds of guests. What are the secrets to a cheap destination wedding? Nowadays, many couples opt to forgo traditional (and expensive) weddings in favor of a more intimate affair at a destination they love. The people who love you will follow you! Destination weddings allow couples to extend their celebration from four hours to four days (or however long you see fit), while creating a lifetime of memories with their close friends and family. Because they are often more intimate than traditional weddings, destination weddings can also be more affordable for couples. Is a destination wedding right for us and our guests? If you’re thinking of planning a destination wedding, it’s likely important to you that your closest friends and family members will be able to attend. Here’s how to start to plan: even before you commit to planning a destination wedding, run the idea by family and friends. If there are relatives who you know you want present on your special day but are unable to attend, you might prefer to have an intimate destination wedding and a reception at home so all your loved ones can be a part of the celebration. Additionally, choosing the right destination may also affect who can attend. This is where South Florida comes in. Miami, Fort Lauderdale, Palm Beach, Naples are are in our area of service. On the other hand, if your destination is particular remote or expensive, less guests may choose to attend. Make sure to consider your closest family and friends when selecting a wedding destination. 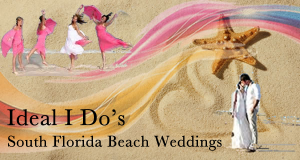 Ideal I do’s is Florida’s leading affordable beach destination weddings company. We are headquartered in Delray Beach. We have been planning beach destination weddings for over four years and have planned over 450 successful beach weddings. While 9-15 months is an ideal amount of time for securing the best travel rates, we have worked with couples that have planned gorgeous weddings with only a few months to spare. If you do have time to plan further in advance, we always advise that couples start the process sooner rather than later, particularly with large groups. Ideal I Do’s Beach Weddings are Personalized! Florida is the most affordable beach destination. Traditionally, the best way to help ensure that your guests can afford to attend your destination wedding is to plan in advance so they have ample time to plan and budget accordingly. It’s also important to consider the resort, destination, and time of year you’d like to marry. How do I get the best prices on travel packages? Simple. We work with travel agents and hotels to get you terrific group rates. Planning well in advance is key – as prices are dynamic. Do you have specific hotels that you work with? We shop for the best hotel to suit your needs and your budget. We have over 200 hotels to choose from! Do we have to pay for our wedding in full right away? Nope. Ideal I Do’s offers an “Easy Payment Plan”, which allows you and your guests the flexibility of spreading the travel payments out and picking payment dates that work for you. You can use the “Easy Payment Plan” to schedule out payments up to 30 days before the wedding. Will I need an on-site wedding coordinator? Depending on the ceremony details, we usually recommended that you work with someone at the location to help finalize the details. Many resorts and hotels have complimentary on-site wedding coordinators, for your receptions. We will provide that service for your ceremony. We have successfully planned over 450 amazing beach destination weddings in Florida and arranged travel for over 500 guests. We have 5 years of experience planning destination weddings and frequently visit the locations we recommend to our couples. We work with you from the start planning to the minute you say I do. Let us help plan your perfect romantic beach wedding! This entry was posted in Florida Beach Weddings, Local Florida Flavor, Locations, Money, Time and Work Savers, Real Weddings, Recommended Vendors on May 4, 2015 by admin. How do I know a destination wedding is for me? If your dream destination wedding involves breathtaking scenery at a vibrant resort, all within an affordable budget, South Florida is the place you’re looking for. Not only do our hotels and resorts offer incredible experiences but also at incredible prices. This entry was posted in Florida Beach Weddings, Locations, Money, Time and Work Savers on May 1, 2015 by admin. It might be just a dream of yours. Or, at least a gauzy vision inspired by a romantic movie. You awaken in your beachside hotel that overlooks the azure Atlantic ocean with warm beige sand. That swirl of white crescent wave and bit of blue out your window couldn’t be more calming. That’s because I’ve come here to get married—and the scene set by the beach and ocean is nature’s altar and wedding decoration. At Ideal I Do’s, south Florida’s premier wedding company, you will find all sorts of beach wedding packages to suit your needs and budget. Whether it be a celebration for 2 or 200, this is your day, my stay at this gorgeous beach to celebrate your big moment, seems more like her wedding gift than a ceremony. Set amid the United States’ longest state shoreline, far flung enough from the snowy north, the serene ocean beckons as a haven. It’s the place for a bride and groom to hide out (although, if you visit, you’re like to glimpse one) for honeymooners hankering to focus on one another, and for families who understand the concept that sometimes doing nothing at all is really doing everything. With 175 hotels to choose from — some that dot the very edge of the beach from high-rises to a colonial styles, and a handful of two-and-three-or five bedroom villas to rent for a week, scatter down the shoreline like tide-deposited seashells, South Florida makes the perfect place for a destination wedding of any size. Our couples do bring smaller groups, 10 – 50 or so, and hold ceremonies on the beach, on the verandahs of sea-facing hotels, and in the gardens and parks in the area. Some brides and grooms come alone, choosing to make this their day alone, and letting the Ideal I Do’s wedding-planners organize every romantic detail. There’s plenty to amuse kids here as well. Besides sandcastle-building, South Florida offers a bevy of beach toys and activities, from stand-up paddleboards, to sailboats, jet skis to bikes, and we can organize scavenger and outings to kid-pleasing places such as Jungle Island, and the everglades as well. Wedding guests, groomsmen and maids can likewise entertain themselves. Besides the hotel pools, often ringed by linen-capped day beds, Ideal I Do’s offers to organize daily fitness walks on the beach with breakfast, and customizes itineraries to include sunset cruises, snorkeling expeditions, diving outings, and deep sea fishing adventures. This entry was posted in Florida Beach Weddings, Local Florida Flavor, Locations, Uncategorized on April 27, 2015 by admin.